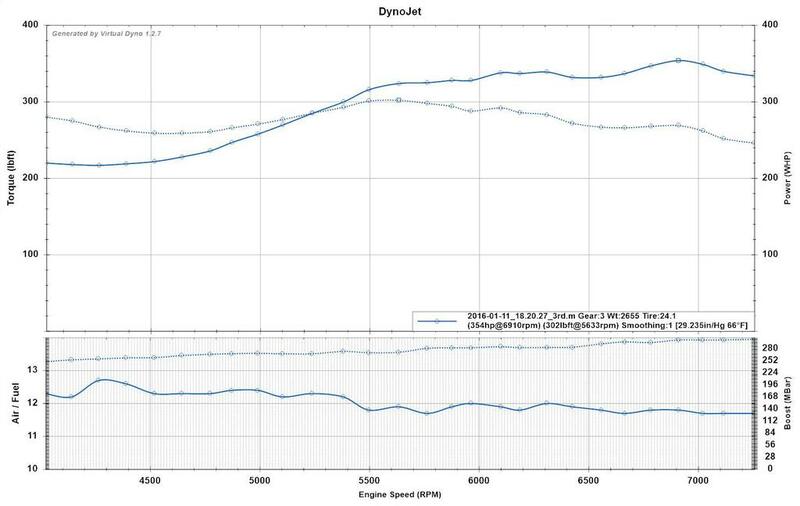 Whipple Virtual Dyno Results - Miata Turbo Forum - Boost cars, acquire cats. 354whp/302wtq on a 3rd gear pull on drag radials. In the past the car has shown 30+ more hp/tq doing 5th gear pulls vs 3rd gear. My guess is a 5th gear pull would put it closer to 380whp. Either way it's a blast on the street! Very fun to drive, spins second gear sometimes on drag radials! This is with the timing dialed in based on reading the plugs. I beat on it today with a new set of 8 heat range plugs and pulled them and they are spotless, no black specs, not metal in the porcelain, color band right in the middle of the bend of the ground strap. I had to make fine adjustments to cylinders 2 and 3 to get them all the same. Perhaps it could make more with dyno time, sure, but it's fun and safe like it sits. why would it make any more power in 5th? when you gonna dyno it? If I'm ever in Texas, can I bum a ride? Sure! Just let me know when you're in the area. When I was making 250whp doing 3rd gear pulls, I did a couple 5th gear pulls and it showed 280whp, about 12% higher. Could do a 3rd gear and it showed 250whp again... Might be the transmission is tired, or it's more efficient being in 5th since it's 1:1 without the geartrain losses? I don't know exactly why. I'll try to get a 5th gear pull in sometime to see how it compares to this one. Probably the road is hilly. It's VD and the roads are not perfectly flat and wide open. Though it was pretty flat on this pull I'm sure it wasn't perfect. Like I said I'll try to get a 5th gear pull in sometime. I'd really rather see dynojet pull. I thought Texas was all flat. Peak boost of almost 300kpa and we're supposed to be impressed with "350whp" and "300wtq"? My GT2871R setup did that 5 years ago on ~220kpa. Assuming this is a serious post, I'll respond. This isn't a turbo, it's a supercharged car. This also isn't a race car, it's a daily driver with full interior, all emissions equipment installed and functional, a/c, power steering, a real catalytic converter and muffler to keep it quiet. The car is setup to be daily driver reliable at this power level. Not setup for max power/tuned to the edge. The tune is soft intentionally to keep things safe and reliable. I would bet someone who can tune miata engines on a dyno could find more power out of the setup for sure. There are only 2 or 3 SC miatas I've ever heard of to make this much power on a supercharged BP, and they were race cars and both have blown or parted out/not running engines. I drove this one last night to get dinner. Whether you or anyone are "impressed", I don't care. 350whp was my goal and I believe I have achieved it. I'd definitely like to see a 4th or 5th gear pull from 2000rpms. It seems like I get much more consistent numbers in virutal dyno as I move to higher gears. Those are some impressive numbers though. Have you gone to a drag strip lately or any plans to go? I'm planning to go this weekend, I'd be interested to see how our times match up. Thanks! Agreed on VD being more consistent in higher gears. I'll see what I can do. The last time I ran the car at the drag strip, it ran a 7.58 @ 95mph in the 1/8th. That wasn't at this power level though, I've changed my CAI a bit, added a bigger fuel pump, bumped up the rev limit, and a few other small changes. Also added some weight since then, a nice stereo/speakers/amp and roll bar. I race this car every weekend that the drag strip is open. Last year I made ~130 passes in the miata, 230 in my other car. The plan this year is to race the miata more. That's what I'm doing. I hate the 1/8th, that track is just a lot closer to me so I used it for a couple test runs. All the bits about daily driver nonsense are just excuses. Also would like to see from 2K up as well. The last time I ran the car at the drag strip, it ran a 7.58 @ 95mph in the 1/8th. I can't be the only other one that knows that that's fast as ****. Here, I did the easy part for you. And it's making more power now than it was on that pass by a decent amount. VD showed 326whp back then and I was shifting around 6,800 as the power died off hard up top before. But yes, this is mt.net. I'm not even a little bit surprised by the comments so far. That's reasonable. But I don't have that right now, I do have the VD though which is better than nothing. Hell you were the one that said I needed to do it! And you was right, car is a lot faster now vs then. So since everyone here wants to see my car on a dyno, let me ask a couple questions about that. What type of dyno? Just a dynojet? Certain type or model?